If you are between the ages of 10-18 years and you fall asleep early in the morning (2 a.m.) and have difficulty waking up on weekdays (6:00 a.m.) but no problem waking up if allowed to sleep later (8-10 a.m.) you might have delayed sleep phase syndrome (DSPS). Delayed sleep phase syndrome is a sleep disorder caused by the biological clock the regulates sleep. The body has many biological clocks. The biological clock that controls when you fall sleep and when you wake up. Researchers think the biological clock is controlled by genes and influenced by hormonal changes occurring during pre-teen and teenage years. N1 is a light drowsy sleep. If you’ve ever fought falling asleep during a boring class, you know the signs of N1 sleep. The eyes roll upward, it is difficult to keep the eyes opened, the muscles relax and head fall forward. N2 is the first true stage of sleep. You need to be in a monitored setting to identify this stage. N2 is characterized by fast brainwaves called spindles and intermittent large waves called K complexes. N3 is deep sleep. You need to have a little brother or sister to see this stage. This is the stage of sleep when you can pick a child up and put the child in bed and the child never wakes up! Deep sleep is just what it sounds like. REM sleep is what we think of when we talk about dreaming. But actually dreams occur in all stages of sleep. You are more likely to recall your dream if awakened during this stage of sleep. People with DSPS have normal sleep structure that comes at an desired time. Normally, people fall asleep within 30 minutes of going to bed. Once asleep, teens spend a brief amount of time in N1 sleep then progress to the other stages of sleep, N2, N3, REM. When people with DSPS are studied in a sleep lab, they take a long time to fall asleep. They tend to falls asleep between 2-3 a.m. and sleep the normal number of hours for age, about 8-9 hours. With the exception of taking a long time to fall asleep, the sleep structure is normal: normal amount of N1, N2, N3 and REM sleep. What is abnormal is time to fall asleep, this is called sleep latency. The sleep latency will be greater than 30 minutes and can be several hours. Because people with DSPS fall asleep during the early morning hours, waking up in time for school is difficulty. You haven’t gotten enough sleep. If you use an alarm clock to wake up, the alarm goes off during any stage of sleep, especially N3, you are more likely to wake non-refreshed, groggy and feeling just “awful”. You might feel less groggy and awful if your alarm goes off during REM sleep. When you wake spontaneously on the weekends, you are less likely to wakeup while you are in deep sleep. DSPS you can reset your biological clock using one of two methods: rapid reset and traditional reset. Rapid resetting of the biological clock could trigger mania in people at risk for this condition and should be done under the care of a knowledgeable health provider. It involves staying up all night and going to bed the next day at the desired bedtime. The more traditional way to reset the biological clock is to go to bed 15 mins later for a few days until you reach the desired bedtime. Regardless of the method used to reset your biological clock, you'll need to maintain the rhythm. This is done by using "sleep hygiene". 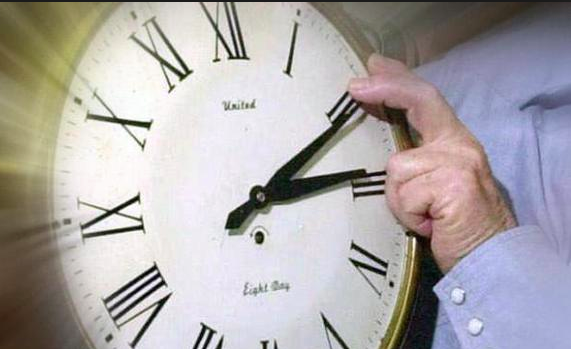 Here are some additional websites to help after you reset your clock. Here are resources for additional information on resetting your sleep clock. The disorder is more common in pre-teens and teenagers.